CHAMPAIGN, Ill., 8/31/18: When Vermilion River water levels fell as the Danville Dam was removed this summer, hundreds of mussels had to find their way back to the river or they would perish on the shore. Lucky for the mollusks, Illinois Natural History Survey (INHS) researchers came to their rescue, moving mussels by hand into deeper water. 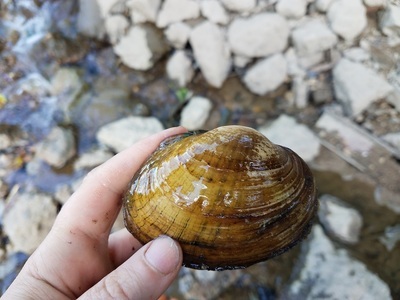 Since the project started in mid-July, approximately 800 mussels from 21 different species were moved in a 2-mile stretch of river, including several species that are rare in Illinois. Once contractors began removing sections of the 11-foot-high dam, water levels in some places fell to less than 3 feet, often much shallower. 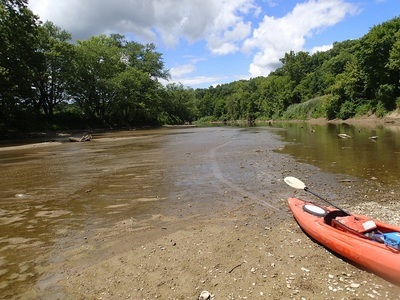 Tiemann and volunteers from INHS and Eastern Illinois University navigated the river with kayaks, plucking mussels from the shore or in shallow spots. One way they discovered mussels was by seeing their trails as mussels tried to move back into the river. The more mobile species followed the receding water levels as the impounded area was dewatered, while those less fortunate were found on drying gravel bars. The dam, which is owned by the city of Danville, is being removed because of public safety issues, with three deaths reported in the past 10 years. However, a side benefit is a restored habitat for mussels and improved passage for fish. While creating a better habitat for fish of all species, the dam removal also offers recreational opportunities. Kayakers and canoers also can enjoy a safer, unimpeded stretch of river. The Illinois Department of Natural Resources funded the ecological rescue project. The INHS team included Tiemann, mussel field biologist Alison Stodola, and mollusk data curator Rachel Vinsel.